SEER is pleased to present their 48th Spring Conference, which will take place March 27-29 at the Grand Hyatt Denver. 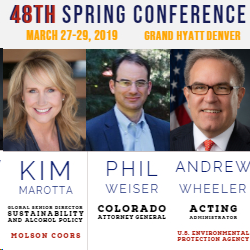 The conference’s keynote speakers will include Kim Marotta (Global Senior Director Sustainability and Alcohol Policy – Molson Coors), Phil Weiser (Colorado Attorney General), and Andrew Wheeler (Acting EPA Administrator). Early bird registration has been extended until March 4, 2019. This entry was posted in Conferences, General. Bookmark the permalink.